Joining the winner on the podium were Mark Cavendish ( Omega Pharma-Quick Step) and André Greipel (Lotto Belisol), finishing 2nd nd 3rd respectively. 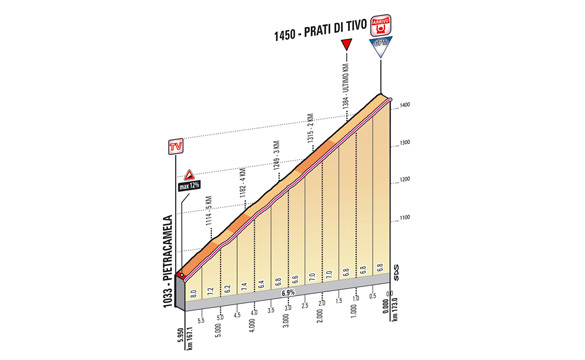 Tomorrow: the first of two key days with tomorrow featuring the Prati di Tivo climb that will take riders to the finish line; 14.5 km climbing with an average of 7% and max grade of 12% at the start. Vincenzo Nibali won this stage last year and donned the leader's jersey. 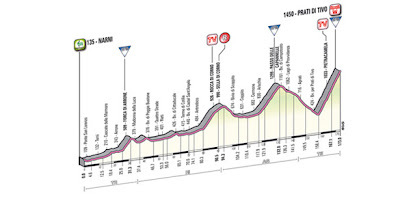 Expect Nibali, Contador, Froome, Evans, and Rodriguez to show their hands.